It’s cold, dark, and blustery and potential buyers won’t be paying attention to the outside of my home. They just want to get inside as quick as possible. In case this is what you’re thinking, I’m here to tell you that home sellers cannot afford to dismiss curb appeal in winter. Here’s why. As much as potential home buyers might be in a rush to get indoors to view your property for sale when they arrive, you can rest assured that they have already spent time looking at the curb appeal: online and in person. Maybe they drove by and sat in their warm vehicle drinking a cup of coffee while checking out your listing and deciding whether it was worth scheduling a viewing. Before that, they probably sat in their own cozy living room with a laptop looking through potential property listing photos with their partner, family, or trusted friend. And even before that, they might have used their phone to receive the listing at work from their realtor who sent a link to the photos of new properties listed that day. After: The curb appeal planter containers add a welcoming touch beside the front entry. Photos taken at dawn or dusk will look more luxurious than during a sunny day. At each step of the way, there’s an opportunity to fail at making a positive first impression of your property. 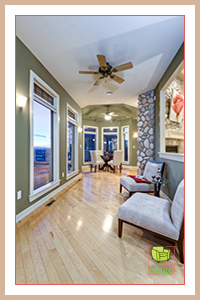 Your virtual image (more than words) is the property’s first impression – and there may be no second chance. 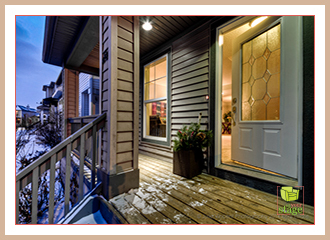 Make sure the right potential buyer actually arrives at your door for an appointment to look inside. If there’s snow (or ice), it must go! Pay someone to remove it from your driveway, walkway and entrance if you must. A professional home stager can help you with your curb appeal in winter and MORE. Start out with your best foot forward by creating an inviting feeling that suits the potential buyer’s ideal lifestyle and stand out from the competition. 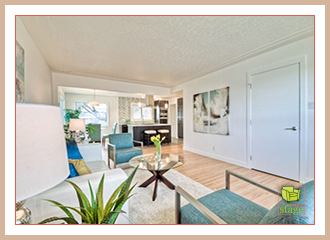 Want to read more home staging tips? Follow Set Your Stage on Twitter. 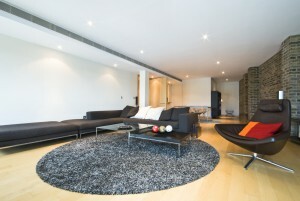 How Much Does Staging Cost in Calgary? So just how much does home staging cost in Calgary these days? It’s a common question that can sometimes come with an assumption that staging remains a bonus for people who can afford it. Depending on your particular property, it’s probably more affordable than you think. People are still trying to figure out what to make of the real estate market in Calgary recently with the changing oil situation. Understandably, it adds a level of uncertainty and therefore stress to what can already be a stressful process of buying and selling property. Sellers want to get the most out of one of their largest investments, and buyers want to get the best for what they can afford. I see professional staging as a way to help both the buyer and seller (and realtor) through this emotional process. That’s because showing your property in the best possible way that appeals to buyers usually gets your property sold faster and often for a higher price. It helps buyers immediately get a feel for what it would be like to live there (there’s no guess work) so they can imagine creating memories in what will become their new home. It helps realtors do their job more efficiently. Now, back to the question of staging cost. It depends on the type of service you purchase. If you have a vacant property that requires full furniture and accessory rental, it will cost you more. If you have a fully furnished property that is already in great shape and just needs some furniture moved in different layouts or a bit of colour added through accessories, it will cost you less. And, if you are a do it yourself kind of person who wants to receive a list of suggestions that you will follow through on yourself, it will cost you the least of all. There’s a lot of room for flexibility to customize the service to meet your individual needs and budget. You just have to ask. Yes, staging costs are an up-front investment. But you get to choose what that looks like. After: The views will take your breath away. Why not find out how much your specific property staging will cost? Contact me, Jen Campbell at Set Your Stage, to schedule your no pressure, no obligation free personalized Home Staging Assessment in Calgary today. You’ve got nothing to lose and plenty to gain. Let me help reduce the stress of the selling process for you. This year, I’m making more green choices. That includes celebrating an eco-conscious Valentine’s Day. Shopping close to my Sunnyside condo is an important part of that. And I have the perfect place to recommend, “honey”. This time last year, I wrote about treating your Valentine to cupcakes, flowers or a massage from shops in Kensington, Calgary. Still a fabulous idea if I do say so myself. And I’ve got another idea for you. I first wrote about this local “sweet spot” just before Christmas when I was in a baking mood and wanted to try a new sugar-free muffin recipe. Did you make some? Well, instead of sugar, I used honey that I purchased from The Beehive in Kensington. Of course, you could also buy some Alberta honey and bake your own goodies for your Valentine this year. But, you might consider some of the other wonderful non-honey items they offer too. Make your own massage kit, including a beeswax candle, Ylang Ylang Vanilla Air Mist (or whatever scent will set the mood you’re going for), and an essential oil Massage Bar. For the man in your life, what about a bottle of Bay Rum foaming bath, either Beard Oil or Fine Shaving Soap, and a Lip Balm (made of beeswax, honey and essential oil) to keep his lips kissable. And here’s an idea for the stressed and busy person on-the-go to let them know you’re thinking of them when you’re apart. Relax Remedy (easy to tuck in a purse or coat pocket and apply to temples when needed), Grapefruit Hand Sanitizer (alcohol free and gentle on your skin), and a Honey Face Mist (for a quick re-fresh). 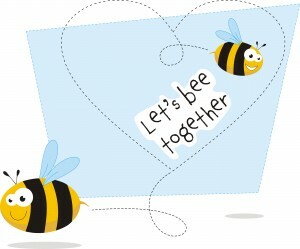 With so many goodies at The Beehive – check it out and come up with your own creative combination. There’s plenty of eco conscious Valentine love to share in Kensington. If you are planning to sell your furnished or vacant Calgary condo, contact me (Jen at Set Your Stage) to find out the benefits of my home and condo staging services and neighbourhood-specific expertise. Schedule your free personalized Home Staging Assessment today. Guest Blog thanks to Heather Roberts. 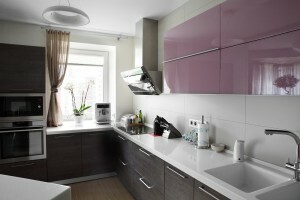 Eco – friendly décor is a subject to certain clichés and prejudices that discourage many to go for this type of interior. Maybe you had the idea of getting some “green” home updates, but you were discouraged by certain stereotypes. The truth is that you don’t necessarily need to sacrifice your style or invest a lot of money. Green design is gaining huge popularity, providing a lot of option to create stunning results at reasonable price. You will not only bring modern feel to your home, but you will also help the environment. Bamboo flooring can be a green option. Eco – friendly and contemporary design usually stand side by side. Currently interior designers put huge emphasis on the sustainable décor. You can achieve the sleek and simple design by incorporating fewer items that posses a character. A designer’s furniture will surely make a prefect addition to your living space, but not all can afford it. Recycling and reusing are basic eco – friendly principles. Take advantage of them? Visit the good will or the flea market. You will find hidden treasures that probably need only a little bit of cleaning and a fresh layer of paint. Depending on your overall design idea you can spray them with intense colour to add a focal point or make a safe bet with white. Contrary to the widespread opinion that there is not a big variety of green home solutions, you will a plethora of different options. If you want new pieces, shop for dining furniture and coffee tables made of renewable materials and reclaimed wood and glass. Look for chairs and sofa that have soy – based foam filling. They don’t require any special cleaning and maintenance. If you are going though some major home renovations, you can invest in an eco – friendly flooring. A good material will help insulate your home and will make easier your domestic cleaning. Cork is relatively new flooring material. It can last between 10 to 30 years. It is very durable and can be used in almost any room. The best thing about it is that it reduces the allergens in your living space. Bamboo is yet another good solution. This is a type of grass shares the same properties as hardwood. The material is sustainable and is offered in different hues. The hazards of commercial wall paints and wallpapers are beyond any doubt. They contain volatile organic compounds that are emitted even after you apply them on the surface. The VOCs contaminate the indoors air and can eventually cause serious health issues. Fill your home with various plants. They will create soothing and calming atmosphere. Plants are also natural purifiers. The greenery will sufficiently improve the indoor air quality. When purchasing new items for your home, you should consider the lifespan of the product. Spend a little bit more on high – quality items that will last for long. Don’t fill your home with unnecessary items. Buy only things that you need. You will save time during your house cleaning. If you are de–cluttering your home, give your old belongings to a charity. For more cleaning ideas click here. Special thanks to our guest writer Heather Roberts. You are currently browsing the Set Your Stage weblog archives for February, 2015.